Since you’re studying this Path, then at all times, in your encounters with people and responses to circumstances, you must not let wrong thoughts continue. If you cannot see through them, then the moment a wrong thought comes up you should quickly concentrate your mental energy to pull yourself away. If you always follow those thoughts and let them continue without a break, not only does this obstruct the Path, but it makes you out to be a man without wisdom. In the old days Kuei Shan asked Lazy An, “What work do you do doing the twenty-four hours of the day?” An said, “I tend an Ox.” Kuei Shan said, “How do you tend it?” An said, “Whenever it gets into the grass, I pull it back by the nose.” Kuei Shan said, “You’re really tending the Ox!” People who study the Path, in controlling wrong thoughts, should be like Lazy An tending his Ox; then gradually a wholesome ripening will take place of itself. 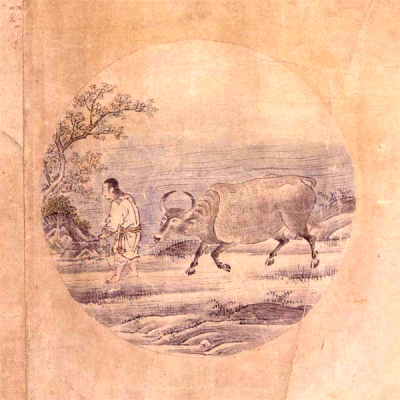 This entry was posted in Wisdom from the Masters and tagged Ox, Swampland Flowers, Ta Hui. Bookmark the permalink.